Choose a topic then click on the arrow buttons to listen to the words. 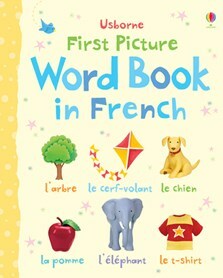 A bright and lively way for little children to start learning French, with over 150 familiar objects to spot and name. Every character or object in each colourful scene is named, helping young children to develop word recognition skills. Themes include ‘home’, ‘animals’ ‘colours’ and ‘my body’, with pages specially created in consultation with a French-language expert to aid learning. Children can listen to all the words on the Usborne Quicklinks Website.